Hey Thrifties! 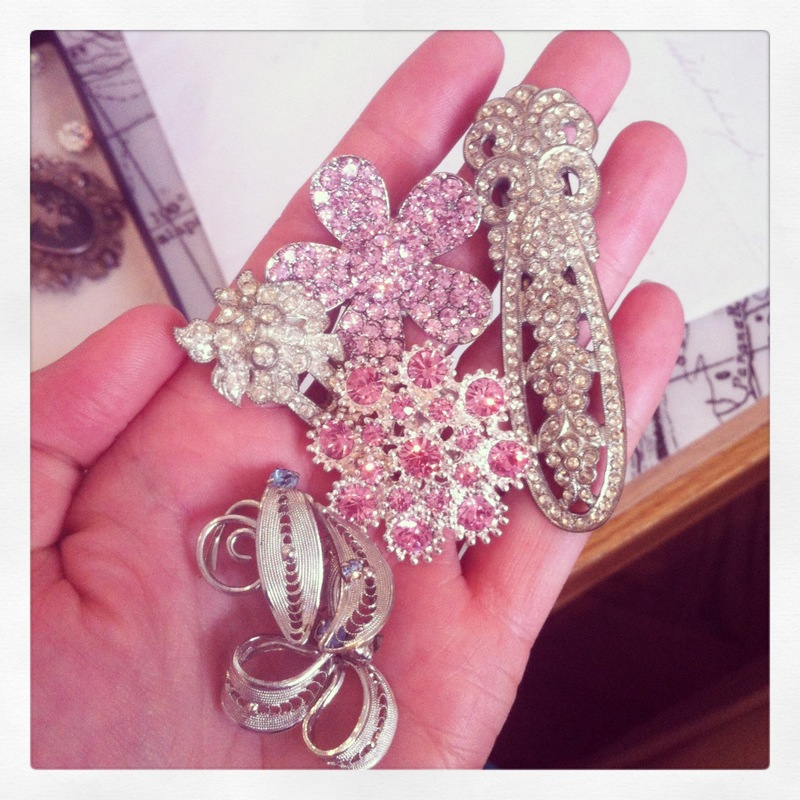 If you're anything like me you've probably got a box full of vintage brooches that you never wear and plenty of bits of broken jewellery that need a new lease of life. "In the year leading up to my Wedding, I couldn't decide which flowers I wanted to have in my bouquet, I'm just not a flower girl and can be very indecisive. We were having two weddings because I am from Australia and my Husband is Swedish, so we knew that asking people to fly to the other end of the planet for a wedding was too big of an ask. 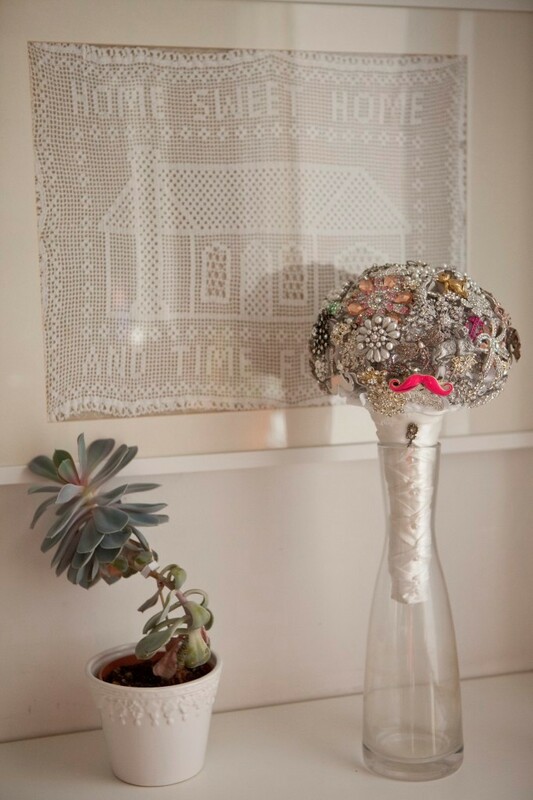 So, while I was back home in Australia booking our Aussie venue and tying up loose ends, I stumbled upon a tiny little brooch bouquet in a bridal store and thought it was fab! I decided that I'd like to have one of those instead of real flowers for a few purposes. 1. We were having two weddings, so I could use it at both. 2. Most of the women in my family would not be able to attend. So I hopped online and started searching. 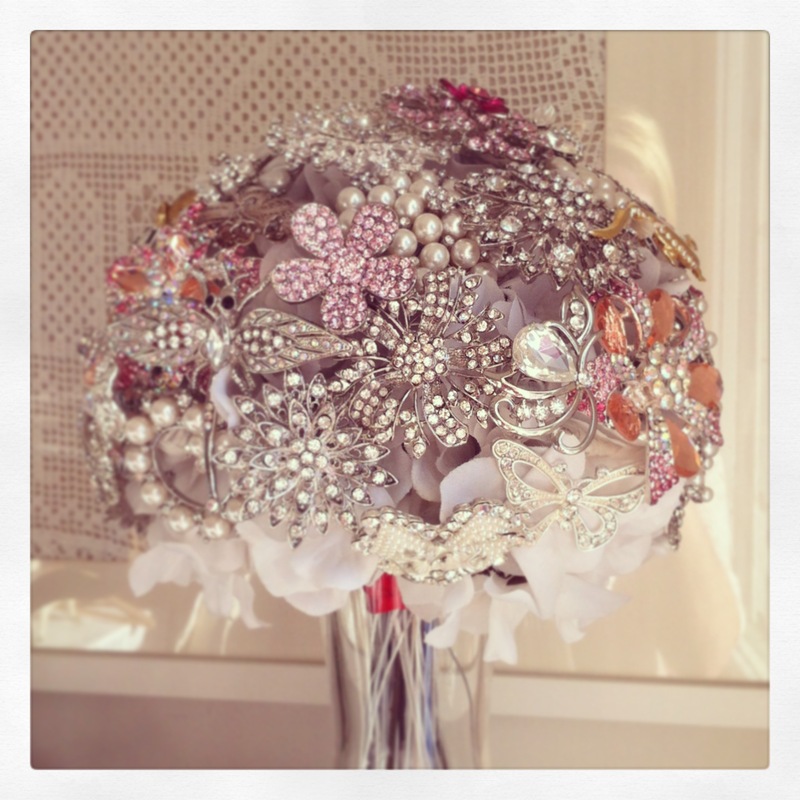 There are numerous places you can buy brooch bouquets, like Etsy, Amazon and Ebay, but they can be quite expensive and usually quite tiny in size. I decided that I could do it better and bigger. Over the course of about 6 months or so, maybe longer, all the women in my family, as well as the women in my Husband's family, and all of my close female friends all contributed a brooch. Some of them are antiques handed down through my family, some are brand new and some are old. I sourced brooches from almost everywhere including jewellery stores in malls, flea markets, antique stores, Esty, Amazon and even yard sales. 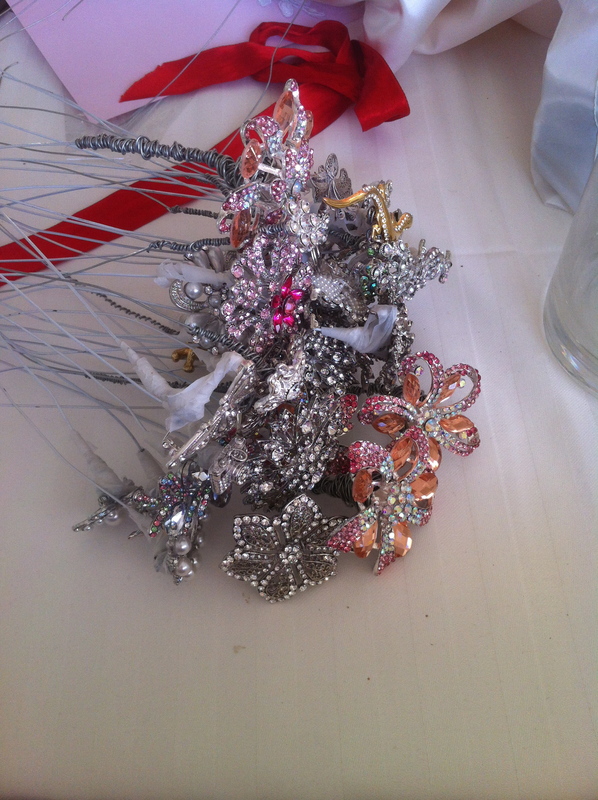 All in all, there are over 200 brooches in my bouquet and it weighs 2 kilograms. So, my intention of taking it with me to our Australian wedding was foiled when I realised I'd have to hand carry it on 2 long haul flights... it probably wouldn't have made it through check in. So I left it at home. But you don't have to make a bouquet as big as this one, it can be much smaller and it all depends on how many brooches you have, and how much patience you have putting it together. After being asked by so many people how I made it, I thought I would do a "How to" blog post. It's not really that complicated, you just need the right tools, the patience of a saint (and a LOT of swear words) and enough time. 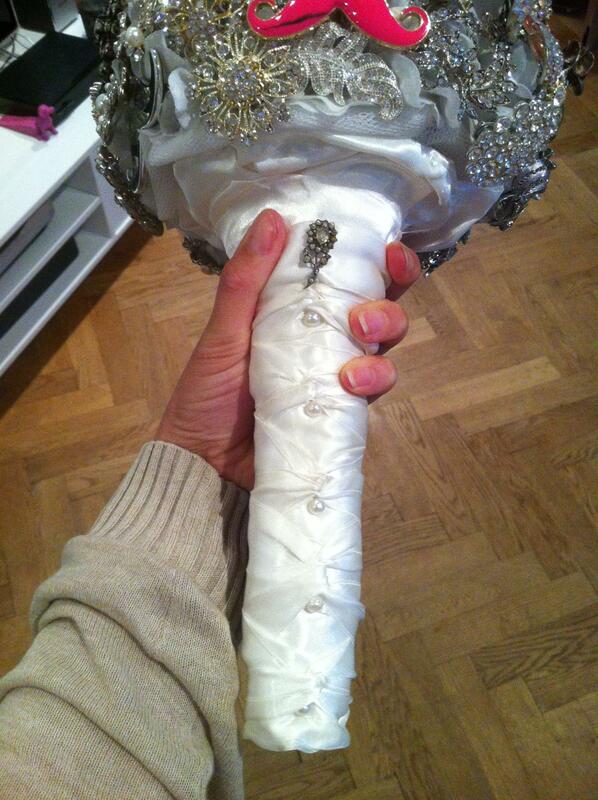 So let's start with a quick list of the things you'll need to complete a brooch bouquet. So, once you have all of that below, you can start to create your bouquet. 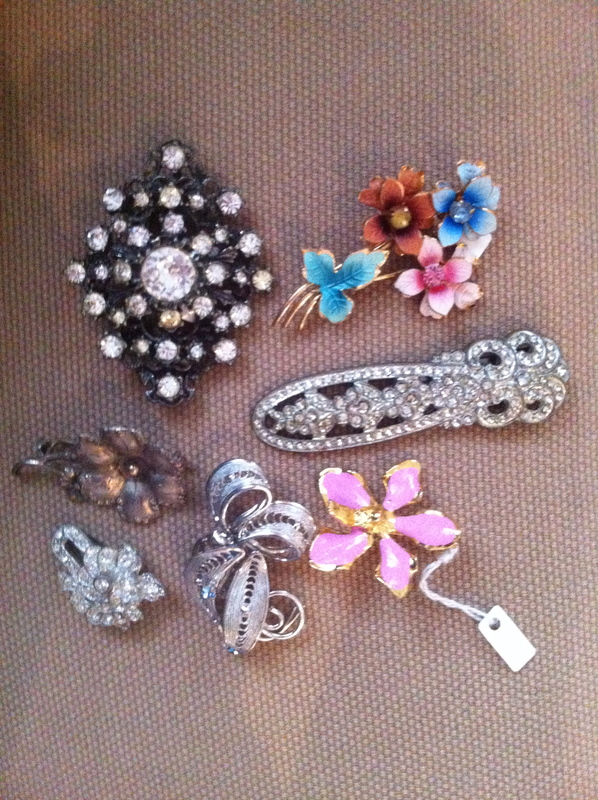 The first step is to find some brooches that you like, love, or that have meaning to you in some way. I chose to ask all my female family and friends to contribute something as a way of having the people close to me at my wedding who could not attend. I have everything from flowers, dragonflies, a Golden Retriever brooch (because I have a Golden), an anchor (because my Husband is an avid sailor), a honeybee from my Maid of Honour (because bouquets need bees), a crocodile from my Bridesmaid (because we're from Australia), and a Gold Teddy bear (an antique from my Grandmother) to a camera (because I'm a photographer). The long floral design you see on the right in the picture below is an antique from the 1920's which I wore in my hair for the wedding. 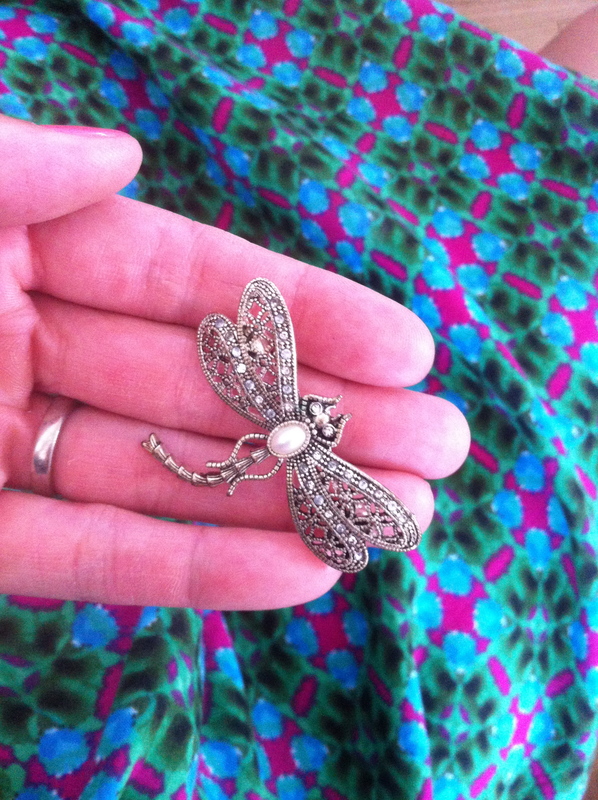 The brooch below came from my best friend back in Australia. 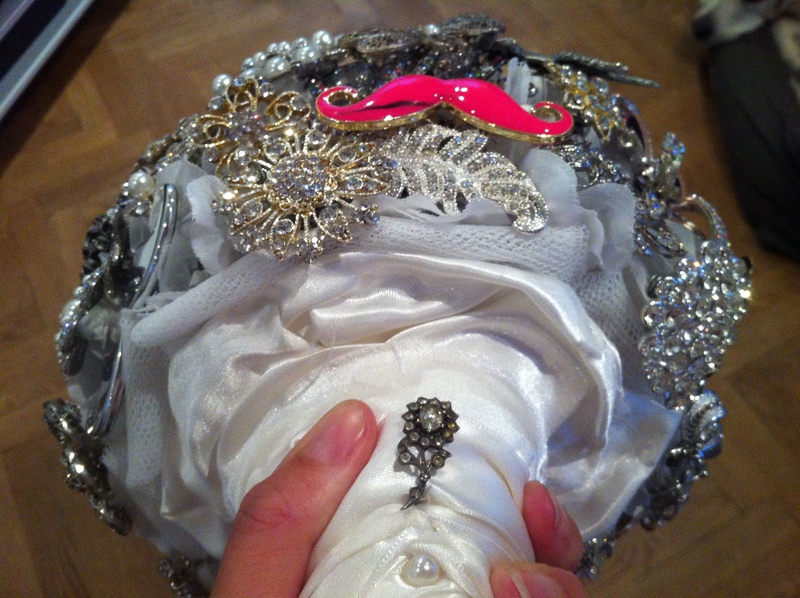 Animal brooches feature prominently in my bouquet because of my love for animals. 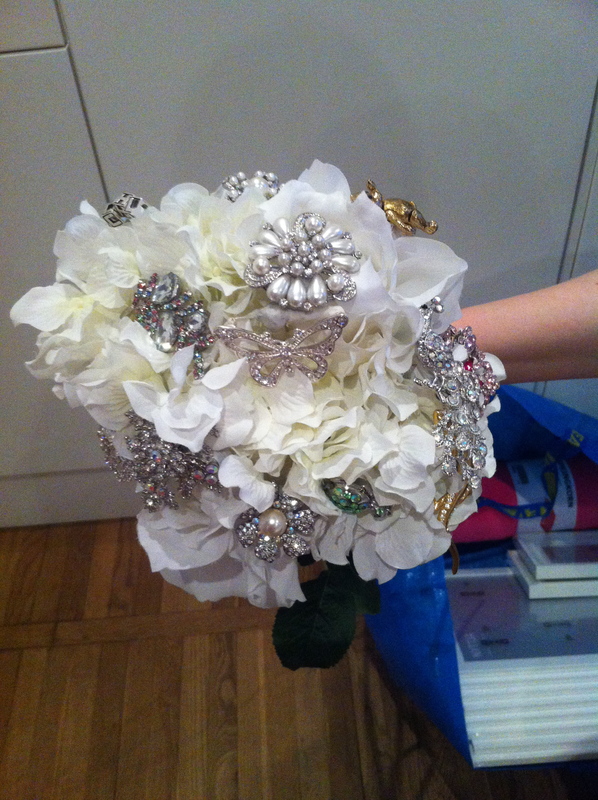 The hardest part of creating a brooch bouquet is turning brooches into "flowers" with stems. To do this you'll need to wear those garden gloves I mentioned. After making 10 of these "flowers" you'll feel like you've played a guitar with metal strings for 5 days straight and your fingers will hurt. So wear the gloves. For the purpose of showing how I created the "flowers" I haven't worn gloves, but you can see the indents in my fingers, and this was from one flower. After 20 of them you'll have cuts if you don't wear gloves. 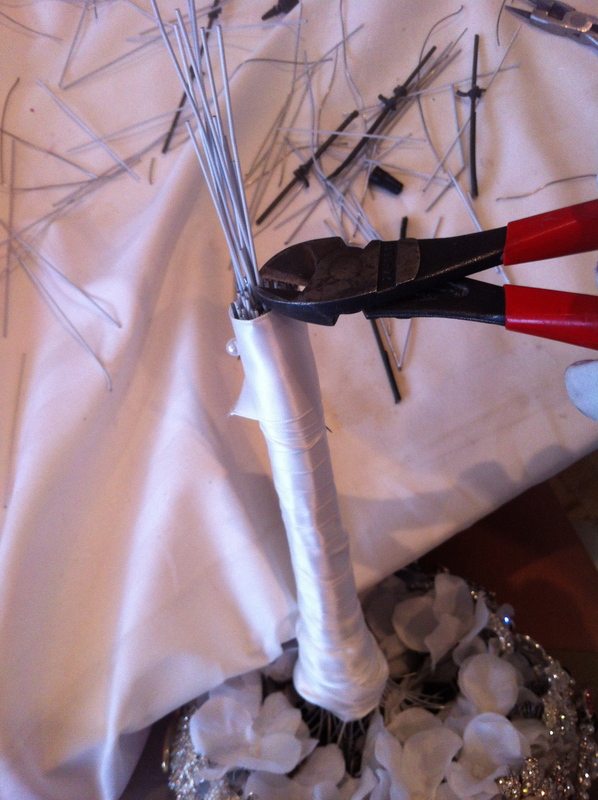 So, the first step is to make your stem from the Florist's Wire. 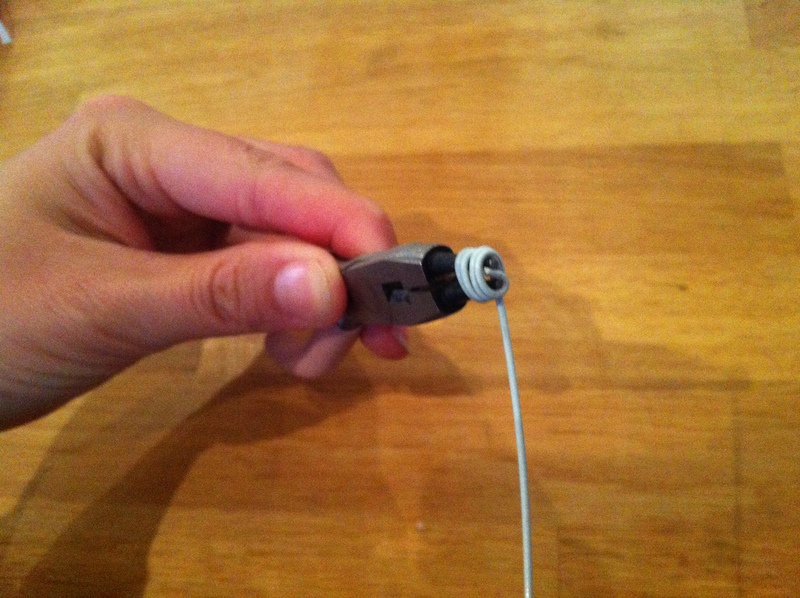 Take your Needle Nose Pliers and then gently wrap the wire around the pliers a few times. You'll end up with a little funnel. Next, take your brooch (this is why it's important to use the clasp style brooches and not the pin style) and use the Jewellery wire, which is much thinner than Florist's wire and start wrapping it around the base of the clasp. 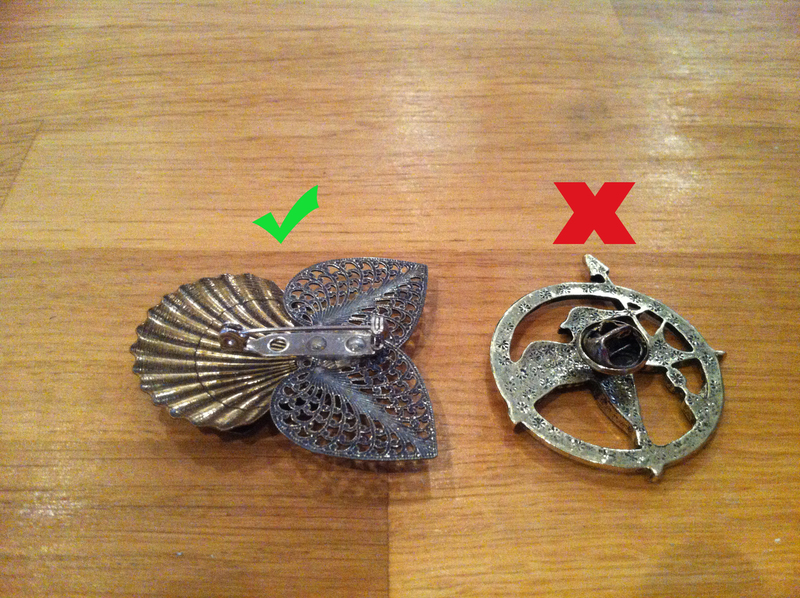 Once you attached it to the closed end of the clasp, keep the clasp open. Insert the needle of your clasp and the other end of the Jewellery wire into the hole of the stem you have just created with the Florist's wire. 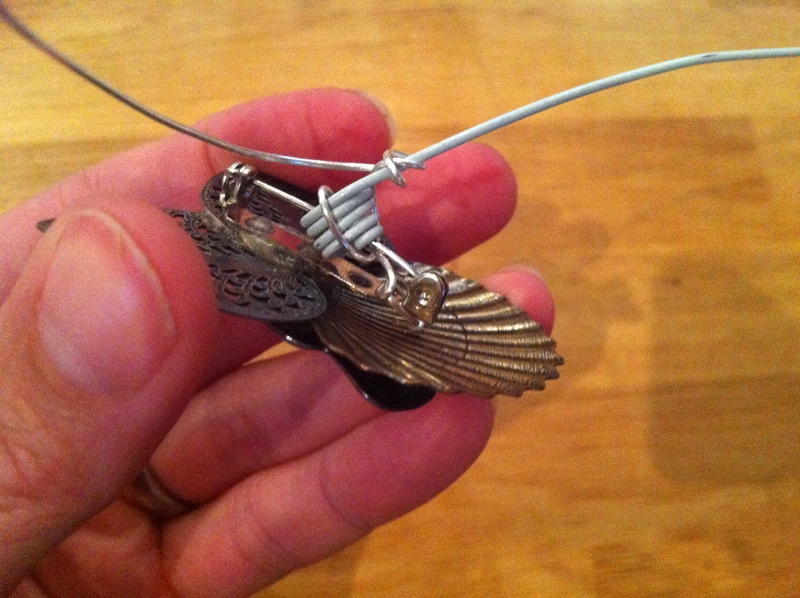 Start wrapping your Jewellery wire around both the clasp and the stem, making sure to keep it tight. 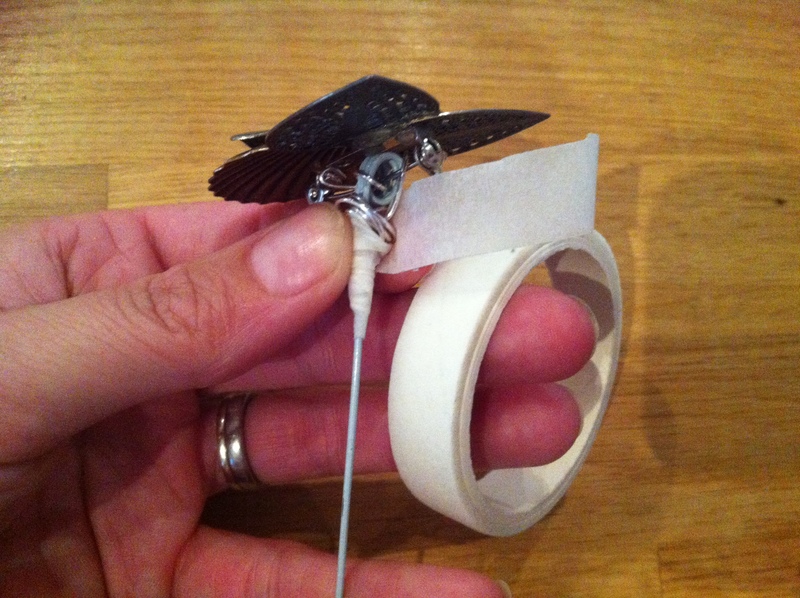 Finish off by wrapping the rest of your Jewellery wire around the stem to secure it and keep it tight. Some brooches are heavier and will need more wire to secure them, but in either case, make sure you wrap tightly, otherwise your "flower head", which is your brooch, will move around. You want to avoid this. 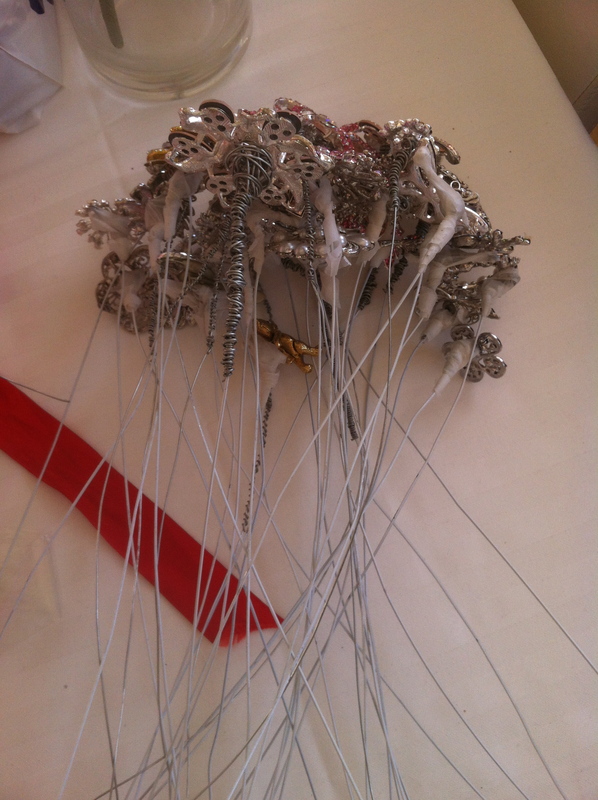 In some cases you'll need heavier wire to make a flower because the brooch will sag. 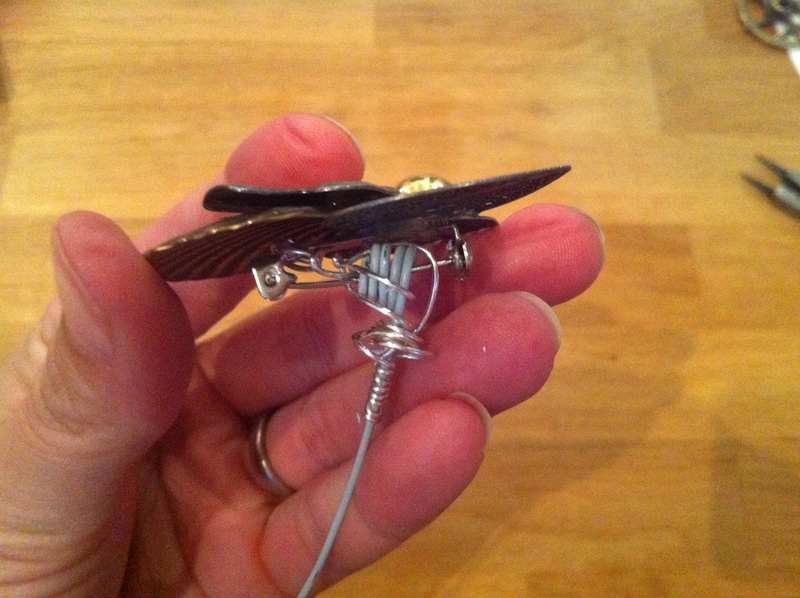 Below you can see an example of a heavier brooch needing a reinforced stem. You'll definitely want gloves in that case. Once you've got your "flower", the next step is to cover up the metal that will sometimes show through to the top. To do this you'll need to use white Florist's tape. It's quite sticky on both sides so you'll be able to wrap it around and onto itself and not use any glue. You now have a finished "flower" ready to be put towards your bouquet. Repeat this a couple of hundred times! Once you've created all the "flowers" you wanted make sure that none of them are loose on the top and that they don't swivel about. It's not overly important to use the Florist's tape to cover the metal, but I found it to be prettier if I did. The next step is to gather your fake flowers and bunch them into the shape you want. The best way to start putting it together is to hold the whole bunch in your hand and start inserting your brooch flowers into the top of your bunch. The more brooch flowers you have, the more you'll cover the fake flowers. Some designs I have seen are like the example below where you choose to show the fake flowers underneath. I decided that I wanted the whole bouquet's surface to be brooches. You can play around with where you place your brooch flowers and come up with a slight design. 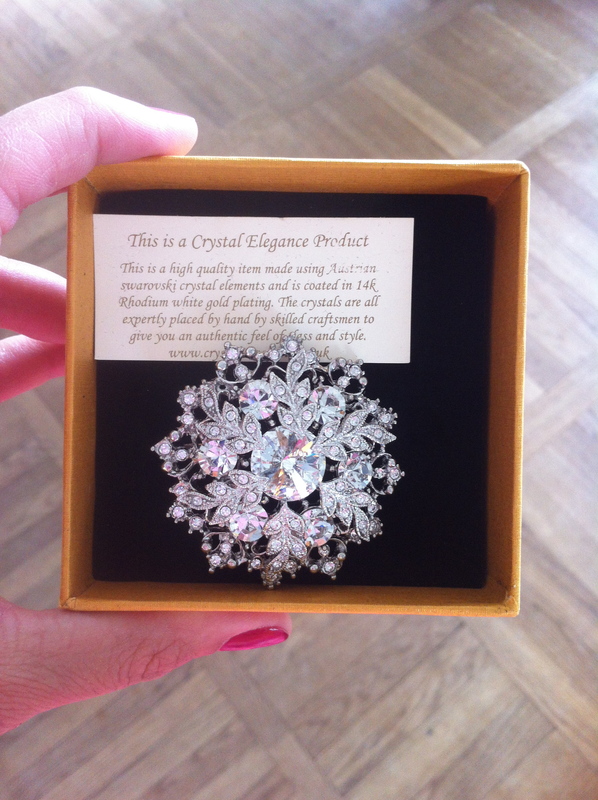 For example, if there's a brooch you absolutely love, try to place it on the very top or at the front of your bunch. By this point, you should have a pretty good bunch coming along and you'll need to stop on occasion to rest, eat, sleep.... so this is where having the long stemmed vase comes in handy. You are still holding your bunch with your hand by this stage, so to secure it, just use a piece of ribbon to tie and hold your bunch together while you take breaks. Then use the vase to hold it upright while you're not working on it. It not only helps to keep the shape of your bouquet, but it looks pretty, too. 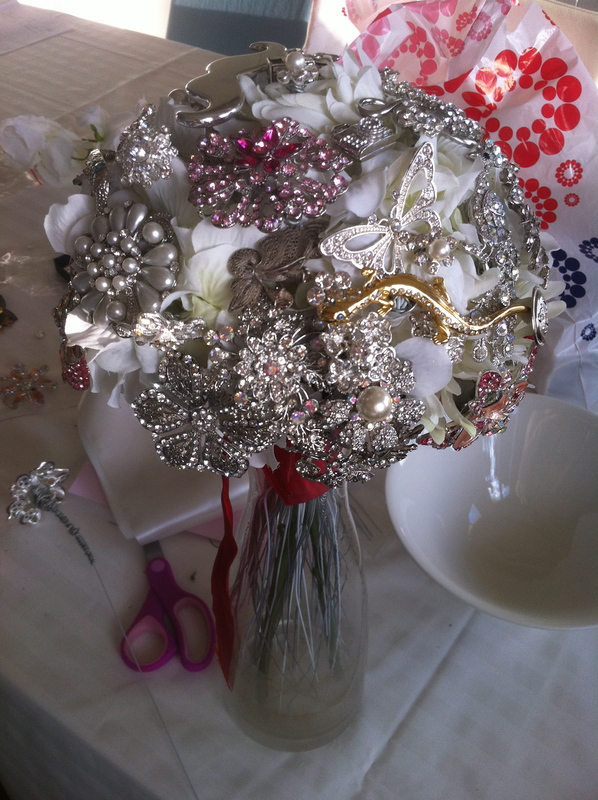 When you think you have all the brooches you want in place, you'll need to bind the stems of your bouquet. To do this you'll need your satin or silk to wrap around the stems and the textile and sometimes super glue to hold it together. This is probably the least difficult part of the whole process as it simply involves wrapping your textile around your stems. It's a good idea to war your gloves at this stage so you don't get sweaty and get fingerprints all over your silk/satin. Before you finish completely wrapping the stems, decide what length you'd like them. Florist's wire is pretty long and once you've put your whole bouquet together they will all be at different lengths. This is where your wire cutters will come in handy as you'll need to clip them all to the same length. 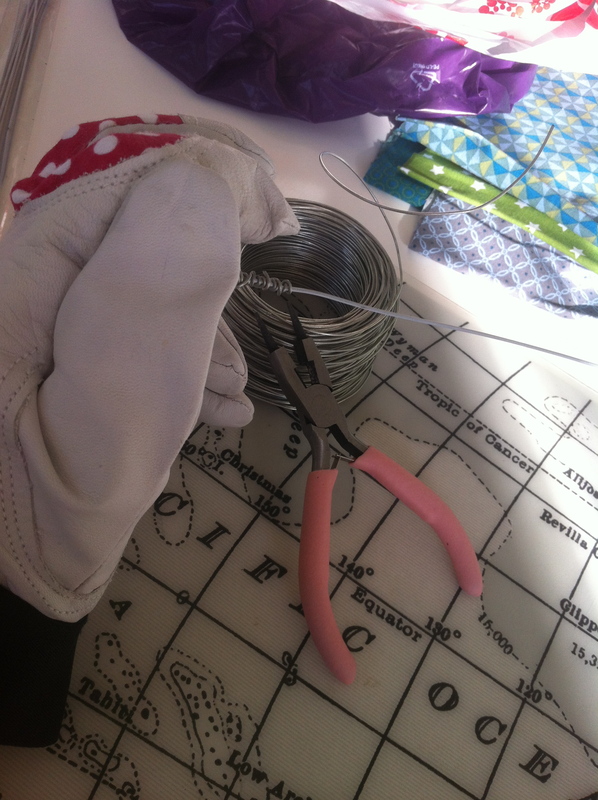 Once you've decided on the length you can then get a little bit more elaborate with your binding. I went onto YouTube and watched an instructional video on how to wrap bouquet stems. I chose a criss cross design and then secured it with Florist's Pins. Then at the base of the bouquet bunch I fixed an antique pin from my Mother-In-Law, which became the front piece of the entire bouquet. You can choose to leave the ends of the stems showing or you can cover them. I chose to cover them because it was difficult to cut the wire to the exact same length and they just looked too metallic for me. Here you can see the underside of the bouquet where I have also used a little bit of soft mesh to help hold up the underside of the "flowers". If you can image a real flower bouquet, Florists will regularly use leaves to help give structure to the entire bouquet. So the material works in the same way those leaves do and you'll need to use either your Super Glue or your Textile Glue to help hold it in place. I also used some pins inside and underneath the final layer to help affix the material to the stems. Below you can see the final product. I actually now use the long stemmed vase to display the bouquet, still. It took me so long to make it, about a year in total and I ended up with bloody fingers at times but I just love it. I love knowing that no one else has my bouquet and that I made it with the help of all the women in my life. It also served as my "Something Old, Something New, Something Borrowed, Something Blue" as well as helping my biceps get a work out on my wedding day! I wish you luck if you choose to do something similar. You will not regret it and if you have any questions don't hesitate to drop a line in the comments section here in this blog post or simply shoot me and email. I'd be happy to help. :-) Happy Bouqueting!" Thanks for sharing Cherrie! I just love that so many women contributed to this which is now an amazing heirloom and keepsake. Choosing a right flowers is bit difficult but it is fun and interesting task to do. I just love Flower DIY. Thanks for sharing this Wedding flowers DIY. Flower DIY is my hobby so I love doing that. Thanks for sharing it. They can be more interesting as we can try different flowers to get different styles. Great guide! With these photos, it’s really easy to understand it. I often see guides that are less informative in text and photos. But your post nailed it, I tell you it’s true. It’s could be more understandable only if you did video blog about it! Also you should check rating of Ultius it not so good as your post but still nice. 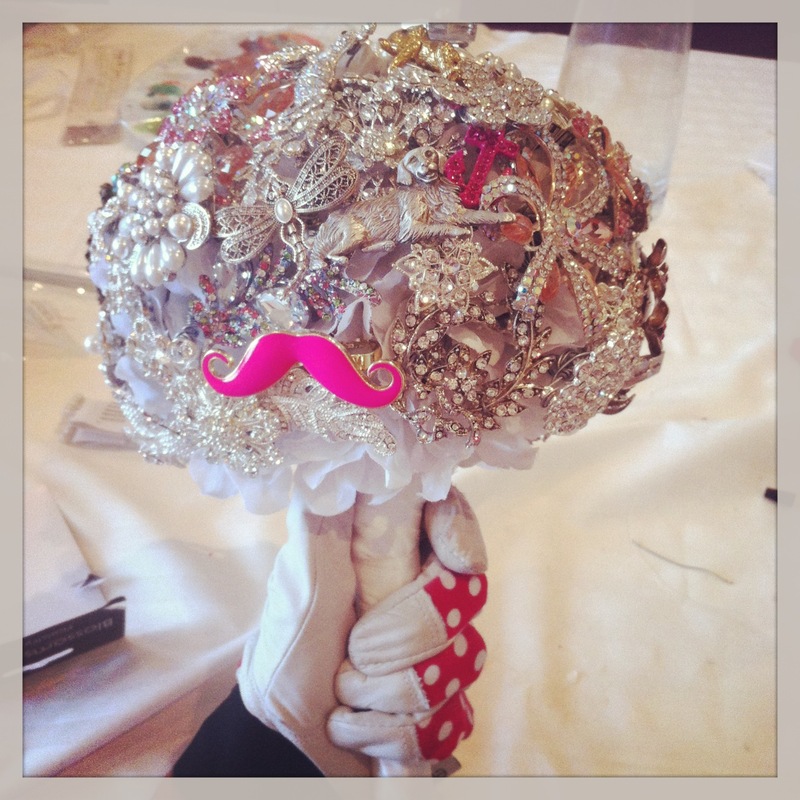 A very unusual decision to create a bouquet for the bride with your own hands and thanks to this you can save a lot of money and be original.